Two words I wish never had to exist in the same sentence. For those of you that do not know what parvo is, the basic definition is a virus in the lining of your puppies intestines. Doesn’t sound so bad, but dear Lord …..I am getting ahead of myself. First I should warn, there is going to be lots of diarrhea talk here….I mean lots….and lots….and lots….. It was bad. And gross. And just…..bad. I want to cry just thinking about it. So if bowel movements and vomit are things that erk you, by all means skip this post. You won’t hurt my feelings. This is mostly out there so I can release the stress of this experience and maybe shed some light for someone else who was just slapped in the face with something they had no clue about the day before. 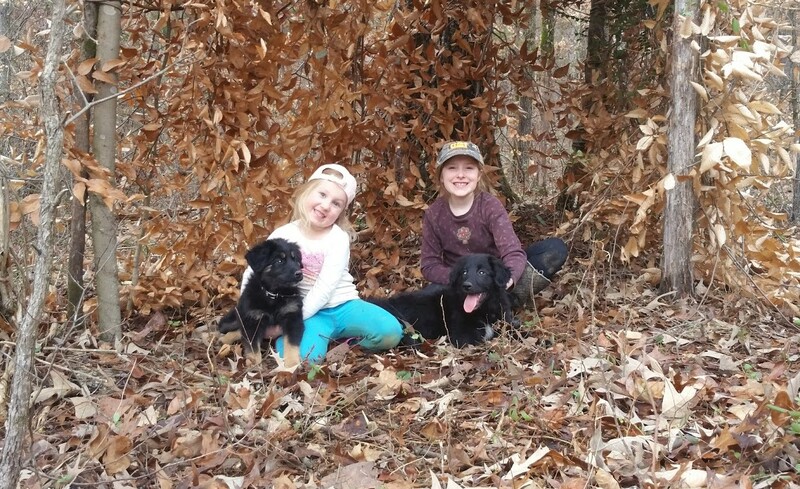 We brought our sweet 7 week old puppies, Josie and Daisy, home on Black Friday as Christmas presents for our kids. The next morning they started having diarrhea which, after scouring the internet, we attributed to the stress of the 2 hour drive home and a change in their food. The pups were as playful as ever so the other serious things just didn’t fit the picture. Josie and Daisy were doing really well at not having accidents inside, we took them to the bathroom every two hours and had diarrhea every time, which I found out later is not normal. Saturday night came and nothing prepared me for what was about to happen. I haven’t lost that much sleep since bringing home a newborn. We took the puppies out at midnight before going to bed and as usual they had their bowel movement. About an hour after going to bed I woke up to one of the puppies just crying like in a panic. I turned the light on in the bathroom and I wished I had been dreaming. There was diarrhea everywhere. I mean everywhere…on the floor, on the gate, on their sheet, on the baseboard and up the wall. And the smell, oh my gosh, I almost puked. In my younger days (aka: before children), if a baby spit-up on me I ran gagging. After being peed on, puked on, pooped on by three children, not to mention all the chicken poop I shovel……nothing bothers me anymore. Until parvo poop. That scene replayed 3 more times that night. Puppy would cry. I would turn on the light. Yell for Chad to take the puppies outside while I dealt with an atomic bomb. The next day we went to church and brought the pups with us, because there was no way I was going let them do that while we were gone for hours. We took them to the potty every hour Sunday “just in case”. Still, we attributed it all to stress and change of food. I actually started hoping that it might possibly be worms. Which is easy to fix. Parvo never crossed my mind because there is supposed to be blood in the stool, which we never saw once. Sunday night came and we had lots of diarrhea replays, but then poor Daisy started vomiting. She probably vomited 10 times between 2 am and 8 am. I knew from that point I was going to have to take them in to the vet. I called my sister, who knows all things animal related. She told me they probably had parvo and that I should prepare for the worst, but I didn’t believe her. I was still hoping for worms. Who hopes for worms by the way??? A desperate person with two little girls deeply in love with their puppies, that’s who. I dropped the girls off with my sister-in-law just in case bad news was around the corner and went straight to our vet. I went over all the details with the vet tech and told her I was hoping it was worms because I was sure there was no way we could afford parvo treatment and they would have to be put down. We decided to do the parvo test first on just Daisy, who was the sicker of the two, before anything else because it would make other tests such as parasite tests pointless. Ten minutes later they were back with the results that Daisy had parvo. I was seriously blind sided, even with my sister and vet tech telling me to be prepared. The vet came in at this point and explained that parvo left untreated had a 90% fatality rate in puppies. She told me that they could keep them at the hospital and treat them but it could be anywhere from $400-800+(per puppy) and there was a chance they would still die. She also said she understood if we couldn’t afford it and putting them to sleep was an option. By the way I was crying the whole time. I know we had only had them 3 days at that point, but I think my heart was mostly breaking for the girls. We just went through the loss of Carson, and now I was going to have to somehow walk them through losing their puppies. I could barley keep it together in front of the doctor. I asked if I could call my husband because I honestly didn’t know what to do. Of course as soon as Chad answered his phone I lost it. The poor man, I can’t tell you how many times he has had to decipher my blubbering. All I could get out was “I can’t do this” and the amazing man that he is….said “I am on my way”. No questions asked. I am seriously thankful for Chad, he takes over when I just can’t “do” anymore. And as a control freak, that is saying a lot. He was there in no time. The vet had printed off two options to show us financially what we were looking at. The doctor told us that basically there is no cure for parvo, you just have to try and get them to live long enough for the virus to run it course. The reason it’s so deadly is because the puppies are tiny, have no fat reserves to live on and will essentially die of dehydration and malnutrition. We could take them home with anti-nausea pills (that they might not be able to keep down) and a bag of saline to give them fluids subcutaneously (under the skin). That was about $400. The other option was to hospitalize them and they would get anti-nausea shots and I.V. fluids. The hospitalization quote was almost $800 dollars and would go up depending on how many nights they had to stay. Hear me now when I say the vet gave us a lot of breaks even with these prices. A lot of things they only charged us for one puppy where they could and didn’t charge us for other things they could have. What drove us to choose hospitalizing them was when Chad asked the survival rate of each option. The doctor gave a 50% survival rate bringing them home and an 80% with hospitalization. The vet made it very clear there was a high chance they still wouldn’t make it either way. For our girls sake, and for their daddy’s sake we chose to hospitalize them. Alright, for my sake too. We try to limit the amount of money spent on animals. We have put down several chickens ourselves (okay, Chad did it, but you know what I mean). 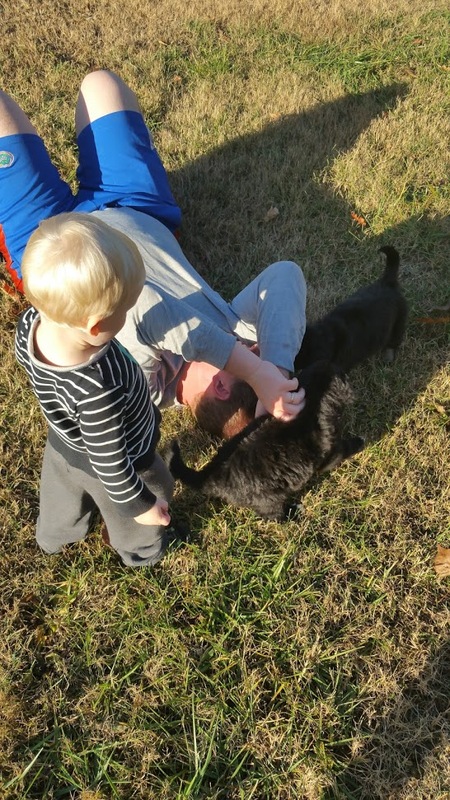 But when it came down to possibly having to tell the girls their puppies passed away, Chad wanted to know he did everything he could to spare them that pain. So we left them at the vet not knowing if they would make it. 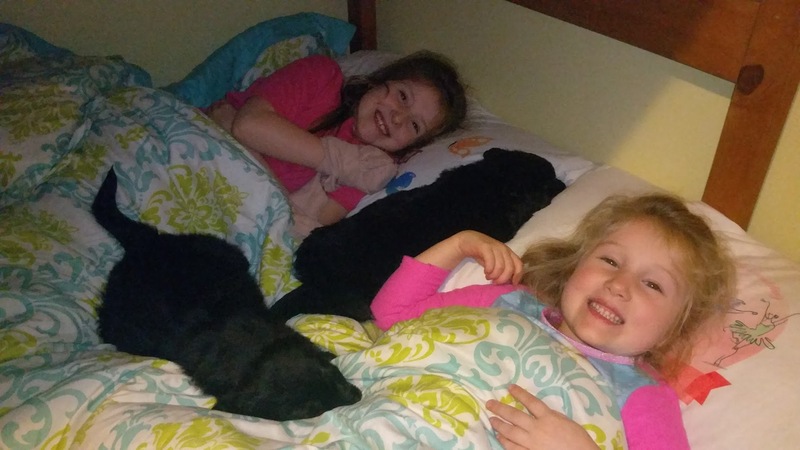 Tuesday morning we got a call that they were doing well and that Josie and Daisy hadn’t vomited or had a bowel movement all night. Which was amazing news. They wanted to see how they did through the day and we would re-assess the situation. Around 4 o’clock we called and the puppies were actually eating and keeping their food down so we picked them up and brought them home. The vet said once you can get a puppy over the hump and get them eating again they are good to go and will bounce right back. They were right. Josie and Daisy were playing and eating like champions. We were so glad. You would think this is where the story ends. Unfortunately not. Daisy started vomiting again in the middle of the night. I called the vet first thing and brought her straight back in. The doctor said she had never seen a puppy relapse and that it must have been a virulent strain of parvo. For the next 3 days I called, or the vet called me and the story was the same, Daisy isn’t eating and she can’t keep down fluids. Every time I turned around I was balling my eyes out for that dog. I seriously thought she was going to pass away. She was only 7lbs when we took her in and I didn’t know how long she could go without eating. Friday the story wasn’t much different but we were faced with a problem. Over the weekend she would only be checked on twice a day and no one would be there to try and tempt her with food more than that, but the upside would be that she had I.V. fluids. Our other option was to bring her home and hope that we could get her to start eating and drinking before she got dehydrated. We decided to bring her home where we could watch her more closely and they sent a bag of fluids home with us in case she became dehydrated. When I picked Daisy up from the vet she was all bones. I couldn’t believe how skinny she was. Within an hour of having her home I was trying to feed her and noticed she would turn away and lick her arm where they had shaven it for the I.V. So I smeared a little wet dog food on her arm and she licked it right off. I put a little more on it and she ate that too. Soon she was licking it off my fingers. She only ate a teaspoon or so but that was more than she had had in four days. Life was smooth sailing after that. Well, except for the fact that they both seemed to keep the diarrhea for the next two weeks. Gosh, I was so over cleaning up that nasty stuff. When I took Josie and Daisy in for a follow up visit two weeks later, I got those worms I was praying for. Hence them still having diarrhea. Geez. But at least we could de-worm and be done with it all. 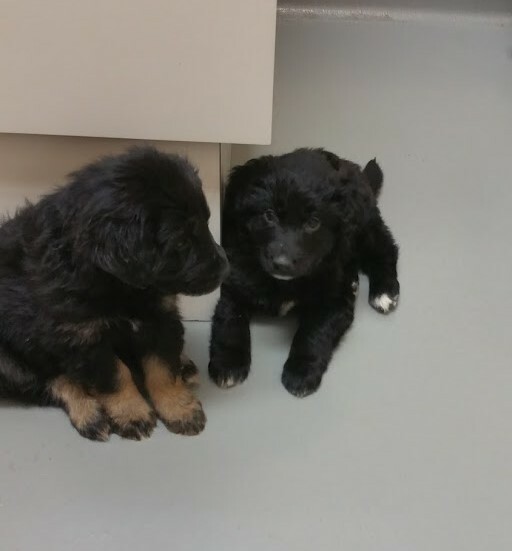 Our vet mentioned that they had several other cases of parvo puppies come in since our pups had been there and that two of them actually passed away even with being hospitalized. That really hit home how blessed we were to have both puppies survive that terrible mess. In the end it cost us $1,200 to save the puppies. I truly believe the I.V. fluids are what saved Daisy’s life, which is something we wouldn’t have been able to provide for her at home. I shared the actual cost for anyone else out there who is trying to figure out logistically how to help their animal. I read on one site it was a minimum of $1600 per dog which was not the case for us. There are options such as Care Credit that you can sign up for at the vet’s office if you need financial help and I believe most vets are willing to do what they can to ease the cost in most situations. Josie and Daisy are now 15 weeks old and eating us out of house and home. Josie who weighs well over 20lbs now and Daisy who is a few lbs shy of 20 (still trying to catch back up) are just the sweetest puppies you could ask for. Well….when they aren’t eating our shoes anyway. They are turning out to be amazing little guard dogs already, letting us know when a car pulls in the driveway with the cutest little “you better watch out” bark you ever heard. We take them on daily perimeter walks through our field and woods to get them use to the property that they will soon be “livestock guarding”. I do believe these are four of the happiest girls in the world. Intended!! Love to all of you!